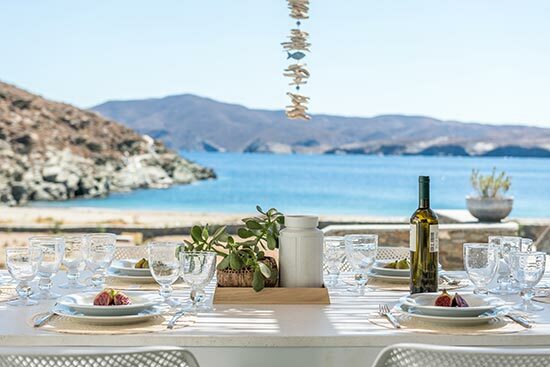 Eneos Beach Villas have a prime location right on the secluded Agios Sostis sand beach. 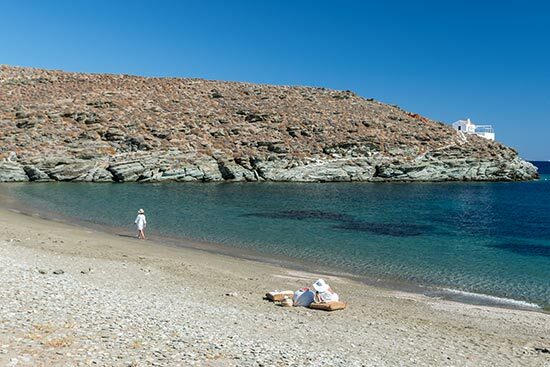 It is one of the best unspoilt beaches of Cyclades islands with the clearest of seawaters. The beach is at your doorstep: stumble out of bed, have a quick morning dip, enjoy your coffee and relax, relax, relax with the meditative rhythm of the sea as you bask on a comfy lounger. Complete your day lying on your sunbed watching the stars and the clear sky and enjoying the sea breeze. Let your senses embrace the sun and the sea. Eneos Beach Villas invite you in a summer escape, to give in to the surroundings and peace and give yourself a break. The ultimate beach experience. Eneos Beach Villas are beside to a Natura 2000 protected area, an ecological network of protected areas, set up to ensure the survival of Europe’s most valuable species and habitats. The villas are in a careful balance of elegance and raw natural beauty. Interesting biodiversity observations are visible from the houses, all year round, giving you the chance to go out on the trails crosses the whole area for mountain biking or trekking with a wonderful coastal view. Sand, water, and kids—it’s a natural combination for easy family fun. 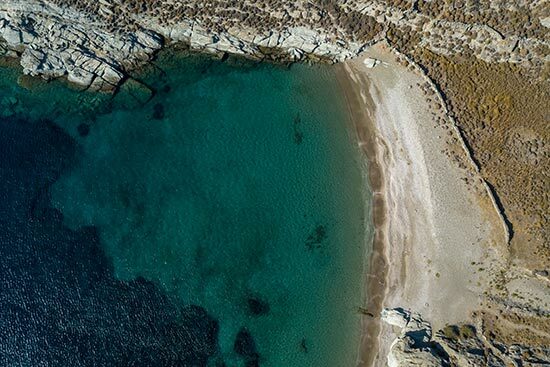 Agios Sostis is a sandy beach giving you the chance to enjoy the sea away from tourist hassle. It is completely secluded as it is nestled within the natural bay of Loutra. It offers appealing, family friendly features such as calm water for kids, clear crystal sea water and endless fun playing with the golden sand. Spend heavenly days sunbathing on the beach while your kids build sandcastles. For coast swimming and snorkeling lovers, Agios Sostis beach is a great start point. Wake up, jump in the water and swim along the coast towards the village Loutra. Enjoy the crystal clear waters of the Aegean Sea and the scenic beaches. Have a stop at the coastal archaeological site of Maroulas, reach Loutra and lounge in the natural thermal spa on the beach. Enjoy some of the most beautiful scenery coastlines in the Aegean. Alternatively, take your snorkeling gear and experience the unrivaled feeling of being at one with the Aegean Sea. Explore the fascinating marine life and the underwater world of Mediterranean. 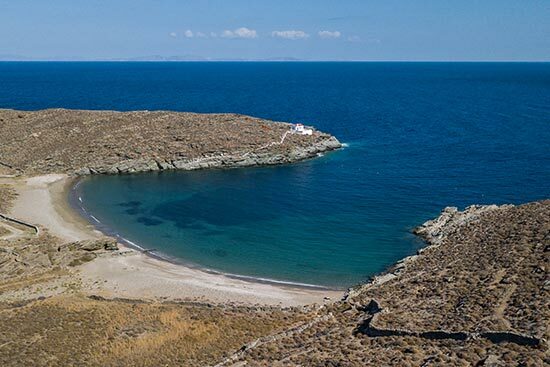 Agios Sostis beach took its name from homonymous Agios Sostis chapel offering protection to small fishermen in case of strong Aegean northern winds as its name indicates. Agios Sostis beach orientation is southeast thus is a wave free beach. 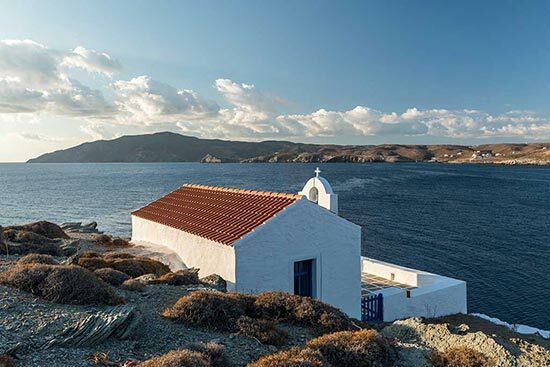 Agios Sostis chapel is built in traditional island style, whitewashed with arched windows. It overlooks on one hand the whole Agios Sostis beach and Eneos Beach Villas and on the other hand the infinite blue of the Aegean Sea. Agios Sostis chapel accommodates private ceremonies like weddings and baptisms. The Agios Sostis beach, the setting of Eneos Beach Villas and the coveted location make them an ongoing destination for fairytale bay weddings and other special events.